Though the temperature of Fall isn't my favorite, the colors of Fall collections are pretty major and chic. 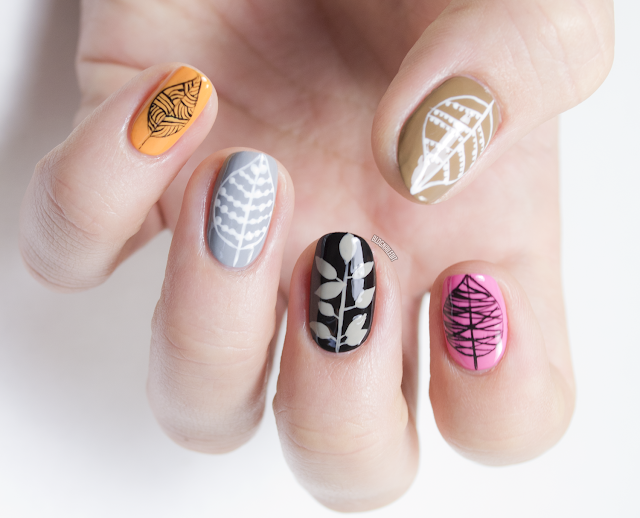 I was inspired by these, and in particular, a leafy pattern designed by an Etsy creator, Eloise Renouf. I riffed almost entirely literally on her design for today's nail art. I really love the middle finger the most...which one's your favorite? What a beautiful design! I personally love the pink nail - this would make all the colours wearable for me because warmish autumn tones don't go with my clothes or my skin. Beautiful! I can't pick a fave, I love them all! These are gorgeous! My favorites are the index and pinky fingers. The patterns on the leaves are absolutely stunning.